I just sorted the postcards in my "needs response" pile into two separate piles. The ones on the right have a return address, the ones on the left don't. Guess which ones receive a faster response? ...For those that don't have a return address: in most cases I know the sender in some way, and can look up their address online or in my address book. But I don't write down everyone's address in my address book, so it's a real guessing game sometimes. At times I don't mind looking up an address online, and at other times, mail-time is strictly computer-free... hence the two separate piles. Now when I say "it's time to respond to a postcard," I can go directly to the A+ folks who do take the extra-credit care to write (or stamp, or sticker-stick) their return address on the postcard. And now I'll get off my soapbox. Everyone has their own mail habits, and if you're one of those carefree types that doesn't include a return addrress, rock on. Just know that if there is a mailing error, it may never reach the recipient OR come back to you, and it may take me twice as long to feel like looking up your address. and I always thought postcards shouldn't have return addresses on them... silly me! I don't put my return address on postcards because I view them as one-way correspondence. I don't expect a reply. If the card arrives safely, great. If it disappears, oh well. That same message will probably be repeated in a future letter. Important Stuff warrants a letter in an envelope, always with a return address and ZIP+4. All that said, I will put a return addy on my postcards from now on because The Missive Maven said to! I sent you a postcard about a month ago but didn't expect a response, so I didn't put a return address on it. Please don't waste any time answering or looking for my address! This is off-subject but I thought I'd come back to post a rant of my own: Canada Post workers are "on strike" right now. They're just having rolling strikes at the moment, meaning that one town will strike for 24 hours then resume service, then another town strikes, etc. But Canada Post Corp (not the striking workers, but the bosses) has announced now that in response, they are suspending mail delivery to 3 days/week. So the corporation is punishing its customers more severely than the strikers are doing. Uh-oh. Guilty as charged. The orange and black pumpkin card on top is mine. Yes a return address is so useful, only to get the letter back to you if there is an error in the address. On occasion I get mail send back the next day because the mail sorting computer reads my address as the to *rolls eyes* but that's more because here we usually put the address on the back. And we even can put only our name, zip & house number on the back here within the country. Oh goodness yes please, return addresses! Better yet, print your address or even better, use a printed label. So many addresses are difficult to read, especially when different countries have different conventions as to how certain letters are written. And my address, being Welsh, looks like a random collection of scrabble tiles, so I use a label. I can understand taking the chance of no return addy if one didn't expect a response. Patty, I know, I looked yours up yesterday (I know it's on your blog) and in fact there is something for you awaiting outgoing pickup in my mailbox right now. Eliza Ward, I owed you a letter as well as a postcard - loved the vintage postcard and forgot to comment on it in my letter, but I also responded to your letter earlier this week. 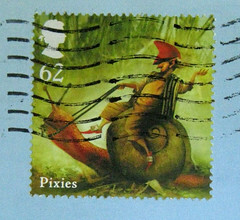 It's in the mail to you, but... oh, the postal strike. I've had my head in the sand about that. My heart goes out to you - mail delivery only 3 days a week! All over Canada! EEK! I never put return addresses on postcards - if I send something to someone I want a response from, I usually put it in an envelope. Also, I'm afraid that the postcard will end up in my mailbox instead of the receivers. And when I write a postcard I'm cramped for space already. Most of my postcards are either to friends (who know my address) or Postcrossing cards, and in my opinion they don't need a return address. I don't need people to send me something back for those. If they really want to they always can ask me for it. But, when I send something to a prolific writer like you, I take care to indicate who I am at least! May I just enter an opinion, since I work at the local post office? Return addresses are essential! Every day, I see postcard after postcard after postcard from all over the world and addressed to loved ones. And if ** I ** see them, it means there's something wrong with the "to" address. It could be something as simple as a transposed number, it could be a lack of an apartment number, it could be the wrong zip code, the people could've moved and not told you; any number of things. 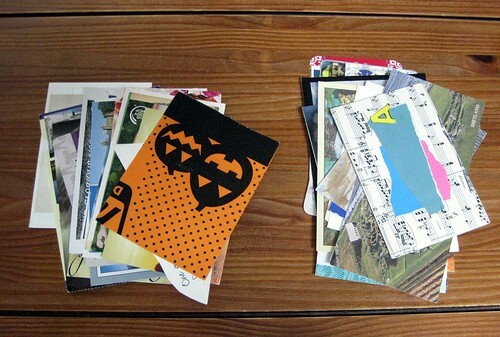 Without a return address, the cards are sent to Atlanta, Georgia where they are destroyed. What makes it even worse is when I see what are clearly greeting cards being sent without return addresses! There again, they are sent to Atlanta where they are opened to see if any identifying information can be gleaned from the contents. If not, or if it's simply signed something like "Mee-maw and Pee-paw", it's destroyed. Then, the time you took to pick out just the right card for that special someone is completely wasted. PLEASE include a return address. None of us like to see a piece of mail not get to where its going. Hear, hear - thanks so much for sharing your experience! Snail Mail: Not Dead Yet!